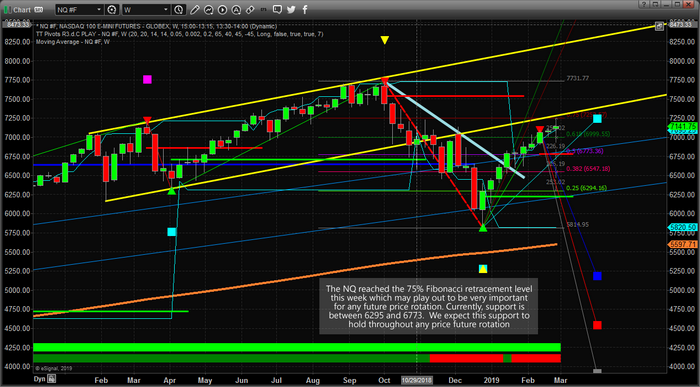 NASDAQ and DOW – Two Spectrum’s of the Stock Market – Technical Traders Ltd. This first chart of the YM on a Weekly charting basis shows how dramatic the upside price move since December 24th has been It also shows the current high prices are very near to the high price levels near the end of November 2018/early December 2018. We believe this “intermediate double top” formation will prompt a downside price rotation towards support near 24985 (or a bit lower). This represents a -5.5% price rotation and will likely frighten a few long traders. It will also embolden the shorts to start to power back into the markets expecting “This is IT! – the Big One”. We believe this downside price rotation will become a very healthy moderate downside price swing that will revalue equity prices, re-establish support and prompt a new upside momentum move that may eventually break all-time highs later this year. In other words, we believe this rotation will be an excellent buying opportunity for skilled traders. 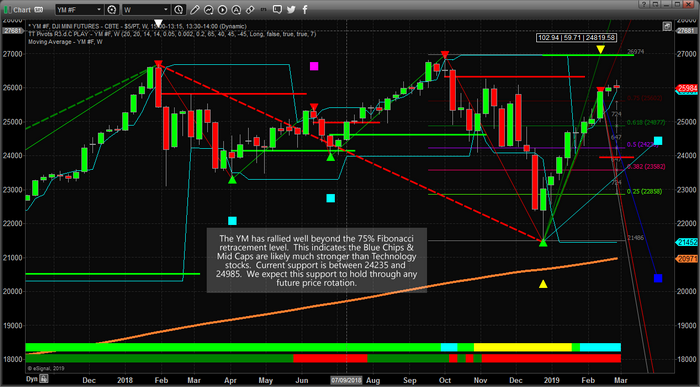 We show our volatility VIX setup forming here.